Not much unlike travelling salesman Gregor Samsa finds himself transformed into a giant insect in Kafka’s well known novel The Metamorphosis, Bohurupee actors in West Bengal (India) have transformed themselves into deities and demons for many centuries; but not just for the entertainment of often frequented villagers along their path. Bohurupee are members of a tribe of ‘actors’ who were ones sponsored by the municipality to teach the locals about the rules of life through Hindustani mythology, now they are living off the alms of charitable people, trying to support a folk art at the brink of extinction. Many of the tribe members who still practice this tradition are above 60 years of age, their children reluctant to pick up the trait because it isn’t profitable anymore. Those left performing bohurupee are therefor determined enough to pursue and teach the youngsters about the importance of morals. So what is that keeps people like Das holding on to the old folk art of Bohurupee, spend a lot of time and money on the attributes, if they don’t get the compensations and respect they used to received? Is it because they uphold a hundreds of years old tradition? Or is it because they don’t have any other skill-set (similar to the Salt Farmers in Gujarat)? The answer seems to be a lot more complicated than that, and offers a wonderful insight into the power of performance as a means towards a more egalitarian society. Many of the Bohurupee are reluctant to call themselves by this term, they prefer the term Shong. A shong used to be a paid performer who took part in the Charak festival and other ceremonial festivities around the province of Bengal. Each had a rich patron paying for them to focus on the character traits of one specific deity and a diverse selection of poems and songs for them to perform. Traditionally, Bohurupee don’t take part in such processions because they are illiterate, instead they entertain people at weddings, community pujas and bandparties, relying solely on their appearance for effect. As a result, they are often accused of exploiting religion for financial gain. 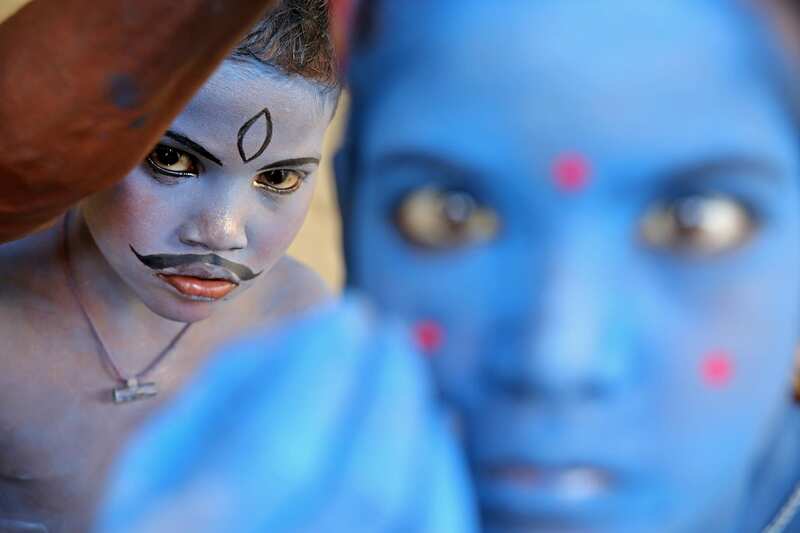 However, many of them are unaware of the long and rich history of pantomime tradition in Bengal, leaving them vulnerable to the scrutiny of classes. Thus, their preference to use the term shong to describe themselves, is merely instinctive, they probably often do not even understand the extend to which their profession is different, making it easier for them to try and blend in with the higher classes. In their mind, the commonly accepted characteristics of the shong- the clown, the harmless public entertainer- fits them perfectly. And more often than not, their cheerful appearance makes them get away with it, allowing them -temporary- entry into different worlds. On spotting the Bohurupee, many will prostrate themselves before the tribe of actors, offering them money out of sheer admiration. In a gesture of illusive power, many of the bohurupee will not accept those alms. Apparently, respect is what they are after, after all they are playing God. But it’s not only that, the Bohurupee make the divine accessible to those who comes across them. Their dexterity give the gods not just a human appearance but also infuse them with mortal frailties. This folk art has the potential to subvert orthodoxy, and, in turn, the power relationships that feed on it. For many Bohurupee, this freedom is equal to mobility, the liberty to move unhindered across diverse spaces- neighbourhoods in the city, obscure towns and forgotten villages. Many are welcomed both by Muslims and Hindus, leaving a trace of joy that people get by seeing the gods as one of their own.